The image below is a sample of a complimentary app Here2There Software created for an exhibition floor at a digital signage expo. Gives directions to and from exhibitor booths. Wayfinding can be defined as spatial problem solving. It is knowing where you are in a building or an environment, knowing where your desired location is, and knowing how to get there from your present location. Wayfinding encompasses all of the ways in which people orient themselves in physical space and navigate from place to place. Even in this modern era of technology, the most popular means of wayfinding is static signage. Universities and hospitals are very public and high traffic environments but still reliant on floor lines, staff assistance and posted signs as the solution to traditional wayfinding. The hindrance in upgrading to an interactive system used to be cost, with most projects exceeding the $25 k mark. The release of programs like Wayfinding Pro (www.wayfindingpro.com) has given subscribers the ability to build a complete wayfinding system for only dollars a month. Wayfinding apps can now be created on any budget for web, kiosk and mobile access to interactive navigation. In addition to a more manageable price, digital wayfinding has evolved as well. What used to be line and text directions alone are now searchable directories, QR code generation and location based content, emergency alerting, advertising and content management integration. Clients now have the power of choice and the advantage of low cost at their fingertips. Wayfinding can be offered by integrators like digital signage companies, as an additional product or integrated into their DS software. End users can purchase Wayfinding Pro, build their own system and offer navigation to their public. Distributors including companies like LGE and Lenovo, can combine wayfinding with their package offering and resale on a large scale. Wayfinding has become extremely versatile and is flexible enough to fit every corner of the market. Prospective wayfinding candidates with a larger budget at their disposal such as hospitals and universities, can sub contract the design and development to experts like Here2There Wayfinding (www.here2theresoftware.com). H2T handles project management, development, design, integration and implementation at the direction of the client. Services like these put control in the clients hands while easing potential work load involved in designing a wayfinding project. Interactive wayfinding is now viable and within reach for any organization seeking to offer or resell the system. Digital apps will replace static signage within the next 5 years, will you be ahead of the curve? Wayfinding Pro (www.wayfindingpro.com) has announced today that Hershey’s Chocolate Co, known worldwide for their contributions to chocolate and charity, has joined Wayfinding Pro to provide interactive wayfinding at their Hershey PA corporate complex. Hershey’s Chocolate will be using Wayfinding Pro’s software development kit to build a kiosk based wayfinding system for navigation of the corporate building. 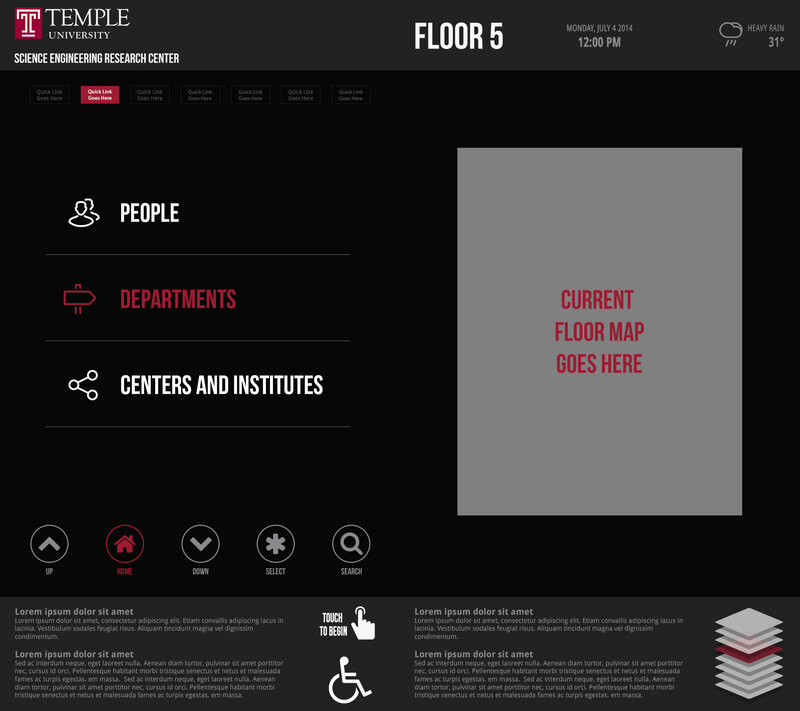 The interactive application will enable users to access internal maps of the building with accompanying step by step line and text directions. Wayfinding Pro is the industry’s leading provider of interactive wayfinding systems, offering the most cost effective solution to traditional navigation. 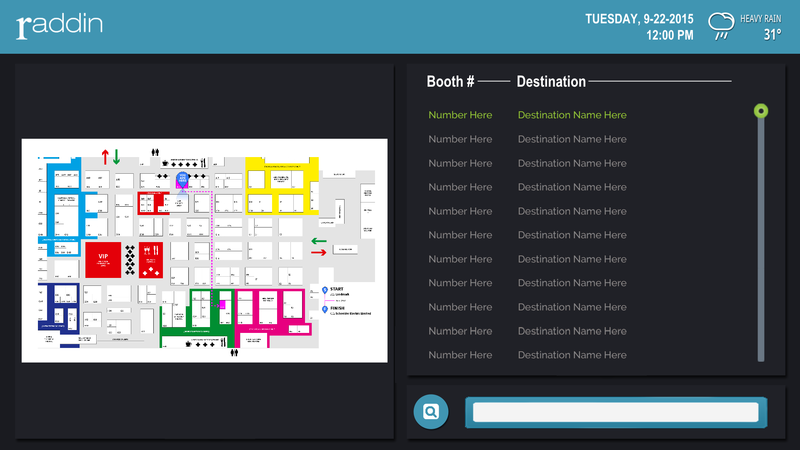 Wayfinding Pro’s software development kit gives subscribers the ability to build their own interactive wayfinding systems for mobile, web, kiosk and digital signage platforms. In business for over 100 years, Hershey’s Chocolate Co has been known all over the world for their contributions to candy and charity. Hershey’s commitment to the public is carried on through the Hershey Medical centers, Hershey Amusement Parks and various factories and complexes. Altoona, PA – Wayfinding Pro, LLC (www.wayfindingpro.com) announced today that Microcad Computer Corporation, long time provider of computer hardware, networking solutions, displays and digital signage solutions has joined Wayfinding Pro to provide interactive wayfinding for their clients. Microcad will be using Wayfinding Pro to integrate interactive wayfinding into their systems, taking traditional wayfinding means a step further. The wayfinding application will provide users with access to maps, step by step directions and directories. Wayfinding Pro is the industry’s leading provider of interactive wayfinding systems, offering the most cost effective solution to traditional navigation and the burdens of high development costs. Wayfinding Pro’s software development kit gives subscribers the ability to build their own interactive wayfinding systems for mobile, web, kiosk and digital signage platforms. Microcad’s business philosophy is to establish long-term, win-win relationships between Microcad, vendors, resellers, and ultimately, the end-users of the products. Microcad understands that having satisfied customers takes commitment, expertise, experience, and persistence. This commitment extends well beyond simply providing quality products, excellent services and competitive prices, focusing on the goal of total customer satisfaction. Interactive wayfinding is a fairly new concept, but is rapidly gaining familiarity and exposure. Wayfinding used to mean lines drawn on hospital floors, arrows pointing in various directions on campus and the time of staff consumed with assisting lost visitors, students and patients. Wayfinding has since transformed to become a convenient digital service that provides step by step text and line directions to any point indoors or out. Furthermore, digital wayfinding has expanded to offer smart phone access, department and staff directories, points of interest, “themed” routes for shopping and tours and even provides real time emergency alerts to ensure the safety of all users. Needless to say, wayfinding has advanced a lot. Digital signage is also an easily recognizable service. You see it everywhere in cities and malls. Signage powered by computers. But what is interactive digital signage? Interactive DS is what you would imagine when someone mentions a “Digital concierge”. This is a service that you can interact with to learn what a restaurants specials are, what the hottest sales at the mall are or which events you should attend at the pier. Interactive digital signage is especially beneficial when placed in hotels. So what happens when interactive wayfinding and interactive digital signage team up? SQ Link. A service that provides its users with local events, entertainment, dining, boarding pass access, flight times, transportation, internet browsing and interactive maps. Imagine being able to upgrade your concierge services with a fast, reliable and visually impressive flat display showing an interactive map of your hotel and local area. Not only could you display the map, but you could enable your guests to scan a QR code or type in their number to have the directions accessible by phone. Outside of providing local dining and entertainment options, SQ Link could be a potential additional revenue stream for your hotel. Any of the bars, restaurants, stores or events local to you could be featured as a first search result or on a rotating add, at a cost you set. SQ Link is also completely customizable. You decide what colors and graphics are displayed, how the interface is laid out and you manage the content. Managing the wayfinding aspect of the application is also easy; and with Wayfinding Pro you can build the system yourself with ease. Interactive Wayfinding and digital signage is becoming a big part of the hospitality industry. Provide your guests with the convenience of all local info at their finger tips and generate an additional revenue stream for your hotel. Talk about easy money. The following article was written on behalf of the Munson Medical Center in Traverse City Mich, in response to the challenges they face with wayfinding. I found this interesting as it brings to light the benefits of interactive wayfinding versus traditional static signs and floor graphics. The end result is an update in painting of different areas, handing out paper maps, and using the staff for directions. While this may be better than the alternative (not having anything in place) it is a short term solution, and stresses the need for interactive wayfinding. “In 2012, the leadership for Munson Medical Center in Traverse City, Mich., decided to address its confusing wayfinding system—again. They’d tried before in 2006, redesigning a system of colored floor lines into one anchored by public elevator cores and a new color/letter scheme to define locations. But between 2006 and early 2012, an incomplete rollout and a lack of internal education caused the program to languish, and complaints about wayfinding grew. Munson’s internal wayfinding steering committee (see sidebar) brought in Corbin Design (Traverse City, Mich.) to revisit the 2006 plan to see if it was worth picking up again or whether a new system altogether should be considered. The next step was a series of Kaizen (continuous process improvement) events to test potential solutions. Predicated on the rule that testing tools be inexpensive, quick to implement, and easily reversed, the Kaizen process allowed rapid prototyping of potential solutions, immediate feedback, and quick response with redesigned logic and tools. Using a volunteer group of MMC staff that made observations and asked questions of visitors three two-day Kaizen events were held. The test route for each followed the central spine of MMC on the ground floor. Using observation and feedback, the team was then able to develop final design solutions. Front-desk staff and volunteers were trained to direct patients and visitors to their destinations by referencing makeshift landmarks of balloons and large-scale paper signage. Balloons were matched to colors already in the elevator cores. The exercise identified a need for simplified logic to be communicated first, but that novelty works as part of the process: “Turn right at the blue balloons.” Printed maps were also shared with some visitors to test information and design. Often patients/visitors mistakenly parked in the wrong lot, requiring a long interior walk to their destination. If they had been given proper parking information prior to their visit, it would solve many of the wayfinding challenges. Patients/visitors are often under stress and are not as aware of their surroundings, walking past the information desk and greeters. The personality and behaviors of the greeters affected people’s willingness to approach them, and poor acoustics in the lobby didn’t encourage conversation. If patients/visitors stopped at the desk but weren’t escorted from that point, they were given the printed map to follow and sometimes were confused when they reached the first major corridor intersection. Interior corridors and elevators weren’t visible from the main corridor and needed to be enhanced. Not all visitors understood or followed signage well but did respond to the temporary landmarks once they’d seen them. Most visitors walked with their heads down or looking straight ahead. 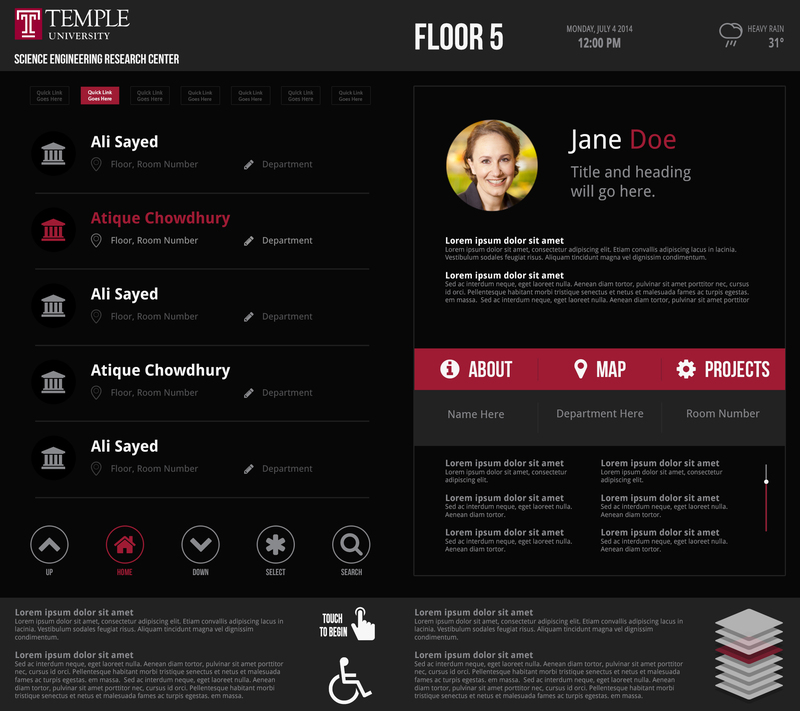 The team learned immediately that, in order to resolve some higher-level wayfinding challenges, a new system of pre-visit communications would need to be designed for MMC staff and referring physicians, with staff education and customer service training required to enhance the visitor experience. For the landmarks, in order to work properly, the test revealed that they must be visible, memorable, easily describable, and unique. The balloons worked because they met all of these requirements, which led the team to brainstorm more permanent solutions that would have the same impact. It was also learned that existing signage was largely ignored. Initial feedback pointed to the overall quantity, lack of legibility, overhead location, and confusing organization of the current signs, requiring the team to remove and/or redesign much of the ground-floor signage for the next Kaizen. Because people tend to look down, the team hypothesized that higher-level wayfinding logic might be best placed on the floor, rather than overhead. Because Traverse City is located near the Sleeping Bear Dunes National Lakeshore, the team chose to test a large-scale image of a sleeping bear as a potential landmark at the intersection that was determined to be the most confusing to visitors. This image was also referenced on a redesigned version of the printed map. The team installed large-scale floor graphics at key intersections that included a letter designation, color, and arrow direction to each elevator. These were specifically designed to be overt so people would see and respond to the directions provided. The signage on the walls was also redesigned to include color designations for each area, with enlarged type for each destination and increased contrast of the typography. Nonpublic destinations were removed from the signs to reduce the amount of information provided. Finally, a redesigned version of the printed map included the color zone logic and removed nonpublic areas. The presentation of the floor graphics was too large to be read and understood quickly and too simplistic; for many people, destinations such as the ED and cafeteria were still difficult to find. Some visitors also didn’t understand right away that the letters and colors on the graphics represented different areas of the building. Those told to look for the sleeping bear landmark found it effective at indicating that they were on the correct path. Visitors reported that even when they forgot the other directions, they remembered this. However, some people didn’t appreciate the choice of a life-size bear. In general, overhead signage was ignored in favor of the floor graphics. Visitors requested that the printed map include exterior roadways and parking areas to help orientation. In response to this set of observations, the administrative staff suggested several tools to communicate correct information to visitors prior to their arrival, including updated printed and Web-based maps. While the bear landmark was memorable, the team decided that the image was too jarring and brainstormed other types of appropriate imagery. The success of the landmark concept, however, inspired the addition of a second landmark located in another primary intersection. The floor graphics were redesigned in the shape of a compass that includes direction to interior “super destinations,” including the ED, cafeteria, and main lobby, as well as arrows pointing toward areas/elevators by using the letter and color designations. The redesigned wall signage, placed as paper mockups over existing signs, was found be successful but didn’t indicate the areas clearly enough. The team proposed removing overhead signs in the next Kaizen to determine whether they were being used. Finally, for those who received printed maps, the inclusion of colored areas was positively received and worked well when used in conjunction with the floor graphics. Having established that the logic and floor graphics worked, the team now tested the idea of “progressive disclosure” on directional signage, or the concept that visitors should first be directed to the appropriate area of the building, then the building level of their destination, and then to the destination itself—providing only the information that’s required at each point of decision. A second round of paper signage mockups covered existing signs, and many overhead signs were taken down to test the theory that these weren’t being used. At the first major intersection, a structural pillar was covered with cladding and painted purple (the color of Area A), creating a landmark easily referenced from the main lobby information desk. Giving directions to the new purple pillar was the most effective improvement tested. Directing to the area first (with fewer signs along the way) and more detailed information about what’s found in each area simplified the signage and was favorably received. As long as visitors were directed to an area and told to look for the floor graphics, patients had an easier time finding their way and staff was better able to give directions. Visitors provided positive comments regarding the color, improved contrast, and simplified information on the redesigned signs. No one reported missing the overhead signs. Participants suggested the addition of landmark elements at visitor elevator cores, since these are not readily visible from some hallways. A new printed map included exterior features, such as surrounding streets, to aid in orientation and was positively received. Because one of the major failings of MMC’s 2006 effort was the lack of coordinated employee education, a number of staff education tools were provided, including a presentation to managers, a single-page guide created for staff and volunteers to use as reference, badges that condense the logic of the program on employees’ two-sided name tag, an internal employee newsletter article outlining the changes, and an online education portal. For the public, MMC’s website was updated with the new maps and directional information, the new logic and graphics were applied to pre-visit appointment letters and verbal scripting for scheduling, and map handouts were redesigned. The team designed large-scale mural graphics using the original color scheme for each area/elevator and imagery to match. For example, the “B” visitor elevators would have blue murals with boating imagery covering the walls at each elevator core. The temporary signs were replaced with updated permanent signage, including final design feedback from the Kaizen. Colored to match the area where they’re located, these signs now include listings of destinations in that area and direct to other areas and super destinations. The entire ground floor was updated, and implementation continues on upper floors of the medical center. Most of the overhead signs have been removed, and a solution for embedding permanent floor graphics has been tested. A full installation is planned for fall. A final printed map was issued to all staff and volunteers. In addition, corporate communications built a series of smaller maps directing to high-traffic destinations, both for print and online applications, including the staff Intranet and the public website. Finally, updated ground-floor map signs have been located in the hallways where appropriate. At the conclusion of the third Kaizen and the rollout of updated wayfinding signage, frequent ground floor “sweeps” were conducted by MMC administrators. Using observation and conversations with staff and visitors, any questions or changes are reported to the wayfinding steering committee for review and response. The response to the changes has been overwhelmingly positive, especially from visitors. Now that the program has been implemented on the ground floor and continues on upper floors, front-line staff—including the information desk, volunteers, and greeters—report that giving directions is much easier. Visitor complaints about wayfinding have been significantly reduced (but not solved), because staff understand and can quickly communicate the new wayfinding logic.